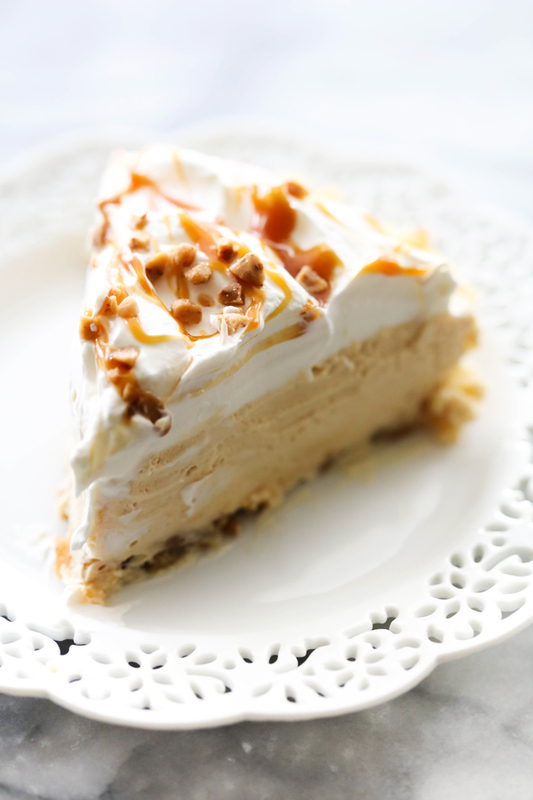 This Caramel Cream Pie is sweet and delicious! 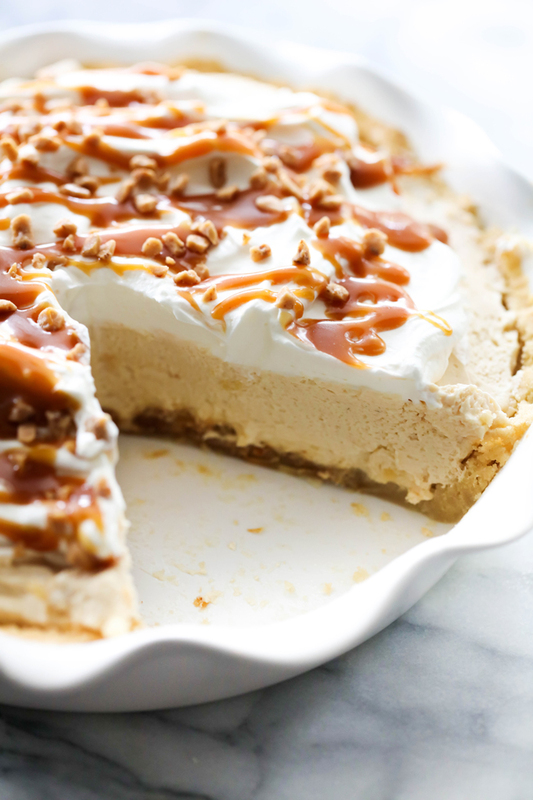 It has a toffee sugar cookie crust, a delicious creamy caramel filling. It it is topped with sweetened whipped cream, drizzled with caramel and garnished with additional toffee. 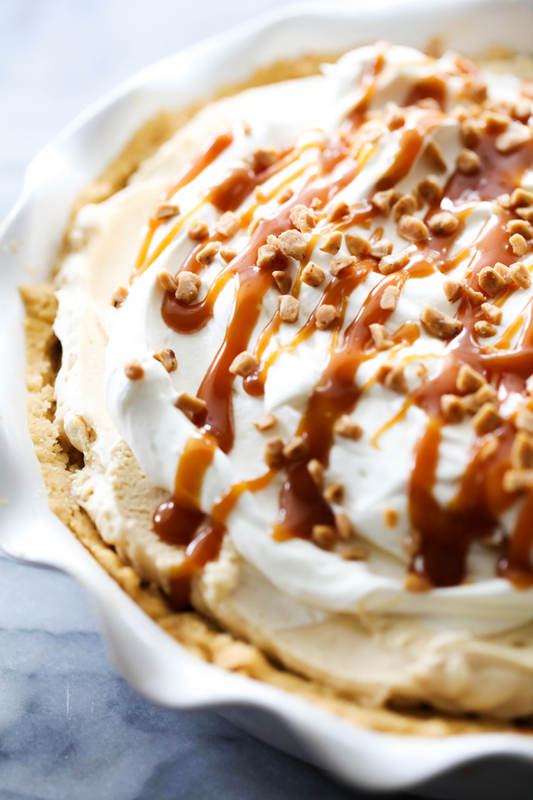 If you love caramel, this is the pie for you! I feel very fortunate to live in a state where all four seasons are expressed beautifully. Fall is my absolute favorite. The trees and mountains look like a painting masterpiece with pops of yellow, orange and red. One of my favorite fall treats and/or ingredient is caramel. Caramel goes with so much and brings so much to a recipe. I knew I had to make a pie where it was actually the rather than a costar. This was a hit with all my caramel loving family members. I need to preface that it is a really sweet pie, but so is caramel which is why I know that if you love caramel, you will love this pie. The base is a toffee sugar cookie and such a delicious addition to the pie. The caramel cream layer is absolutely wonderful paired with it. It is made using my Homemade Caramel Sauce for a smoother consistency. Press dough into 9 inch pie pan. Press ¾ cup toffee bits, evenly sprinkled, into dough and bake for about 15 minutes or until golden brown. In a large mixing bowl, beat cream cheese. Add ½ cup caramel and beat again. In a smaller mixing bowl, beat the whipping cream and gradually add the sugar. Beat until stiff peaks form. Divide the whipping cream in half and fold in one half of the whipping cream into the cream cheese mixture. Save the other half for the top. Spread the remaining whipping cream over the top of the pie. Drizzle with ¼ cup caramel sauce and top with toffee bits. Place sugar in a medium saucepan and cook over medium heat. Stir constantly with a wooden spoon or a whisk. Sugar will begin to form clumps. Keep stirring until it begins to melt into brown liquid. Once sugar is completely melted, add butter remove from heat and stir butter vigorously until well incorporated. BE CAREFUL to not spatter as the liquid is VERY hot. Return to the heat and add the cream. Once again the sauce is going to splatter, so be very, very, careful! Remove from heat and cool for 5 to 10 minutes before using.